Onkyo unveils £700 AV receiver and two home cinema packages | What Hi-Fi? Onkyo has detailed three new home cinema products, including a 7.2-channel A/V receiver and a pair of amplifier and surround sound packages. The TX-NR696, which will be available from next month for £700, promises a generous 175W of power from each of its seven channels and can be used either in a traditional 5.1 configuration or as a 5.2.2 system with Dolby Atmos. The THX-certified receiver, which boasts seven HDMI connections with 4K HDMI pass through, is also capable of upmixing old discs to utilise height channels, while Dolby Atmos Height Virtualizer will recreate that more immersive soundfield for those without dedicated Atmos speakers. Its 384 kHz/32-bit multi-channel DAC facilitates hi-res audio: DSD is supported up to 11.2 MHz, while FLAC, WAV, AIFF and ALAC are up to 24-bit/192kHz. You can also add a second zone for the TX-NR696 to feed a stereo set-up in another room alongside your main home cinema set-up. The receiver incorporates streaming and radio services such as Spotify, Tidal, Amazon Music, Deezer and TuneIn, while the TX-NR696 is also compatible with Sonos, has Chromecast built in and can stream music via AirPlay 2. Onkyo’s new full packages are the HT-S3910, a 5.1 system also available from next month for £500, and the 5.2.2-channel HT-S5915, which will be on sale from June with prices yet to be confirmed. 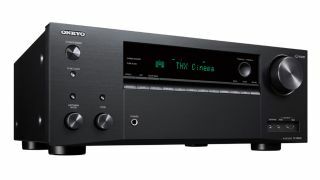 The former (pictured above) comprises a 155W per channel AV receiver with five surround speakers and passive subwoofer, and can also be configured in a 3.1.2 system to utilise Dolby Atmos. The latter, meanwhile, includes a pair of two-way Atmos-enabled front speakers and a 90W active subwoofer; the receiver boosts the power per channel to 160W. Both amplifiers house four HDMI inputs and a single output with 4K HDR pass through, while the HT-S5915 gets both AccuEQ and AccuReflex audio calibration technologies. Bluetooth, USB, coaxial and optical digital terminals and a trio of RCA inputs boost your connectivity options.